Are you a school, theatre, church, university or small business that used a wireless microphone or radio microphones for your assemblies, church services, lectures, auctions, sporting events, live music, conferences or theatre productions? You might be using a handheld or a belt pack with headset or lapel microphone, or perhaps a body pack with your guitar or in-ears… the following information effects you. We both hire and sell wireless microphone system and can help you through the transition with advice as well as options. 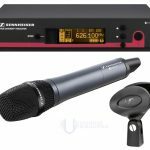 Wireless Microphone Hire Prices: Most of our hire a wireless microphone systems are $50+GST to hire for one day, $75+GST for 2 days or $150+GST to hire for three days to a week. Did you know that as of March 2015 you can no longer use a large chunk of wireless microphones or radio microphones that were used in New Zealand in the past with the frequencies between 698-806 MHz being allocated to digital TV and no longer available for use with audio and microphone systems? Your wireless or radio microphones with the frequencies between 698 and 806 MHz are now illegal and will need to be replaced, traded in or upgraded. We can help you find replacement microphones or help you trade in your out of date wireless microphone for new ones that a in the legal range. The new legal frequency ranges are 502 to 606 MHz and 622 to 697 MHz. Wireless microphone Sales: Please give us a call if you would like help with replacing, upgrading or trading in your old wireless and radio microphones. We can supply Sennhieser, Audio Technica, Shure, Mipro and more. We have helped numerous clients get good deals on trading in their old out of date microphones, with the trade in discount depending on the brand you choose as your replacement. Many of our clients from schools and churches have used this as an opportunity to apply for funding and have had us quote to upgrade their whole sound system and lighting installation at the same time. We are happy to come out and do a free consultation or appraisal and provide you with quotes for improving or upgrading your wireless microphones as well as PA system installations or lighting… A hall or venue with a good sound system is more likely to be hired out by community groups for events outside of your normal hours, so you could use this as a way to leverage your theatre or halls value to you. Check out this little article on New Zealand Musician magazine that mentions us! We are putting on a small school production and need 5 lapel microphones. We are on a tight budget and would like to know if you have any available and how much. My church Sunday School is doing a Xmas production next month so sought advice in hiring 6 headset microphones please advice.